Watch the entire video above for the complete interview. Jay: Hey everybody, it’s Jay Baer from Convince & Convert. 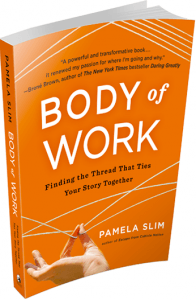 Joined today, New Year’s Eve Day, by a very special guest and dear friend, whose brand new book, Body of Work, comes out today, this very day just in time to satiate your New Year’s craving for self improvement. It is the one, the only, the striped Pam Slim. How Pam and how are you? Pam: Hello, Jay, I’m so happy to be here in my stripes. I think it will be new Who Moved My Cheese? for the next generation. I think it’s going to be an instant classic. It is an absolute blockbuster. Congratulations. I think it’s just outstanding work. Go get Body of Work. It doesn’t matter where you are in your career, if you have it rolling, or if you have it all figured out, or if you still are struggling to figure it out, there are things in this book that can help you improve your career and be a better person. I wouldn’t expect anything less of you, but it really is fantastic. Congratulations. Pam: Thank you so much. It means so much to hear that from you, Jay, and I’m really excited about it. One of the main reasons that I wrote the book is I feel like we have so much uncertainty, and people are very concerned about what’s happening in our economy and our careers, and I see a lot of optimism, because I probably work with creative people all of the time, and working in new ways, and I really wanted to provide a framework that would be fitting for the 21st Century. Instead of looking back and saying, oh, I wish it was the way it used to be which is only going to cause consternation, how can we say how is the world, which by the way is inherently unstable and maybe develop new skills for the world of work. So I’m so glad you liked it. Jay: Yeah, and you said it right at the outset of the book and I think this is a key theme, which is that nobody is looking out for your career anymore. It’s not if you could sort of hitch your string to the kite of some major manufacturing company, and they are going to take care of you for 40 or 50 years. My wife’s grandfather was an executive with Bethlehem Steel and worked with them for decades and ended up being the COO or something along those lines. But he was there from his entire life and still receives a pension from them, and it just doesn’t work that way anymore. Can you elaborate a little bit, the fact that your career is in your own hands now and perhaps ways that it wasn’t historically? Pam: What I felt like happened, especially 2007 and 2008, when we had the major economic crash, it felt to me like all of a sudden as a collective global workforce everybody said, oh my God, nothing is sacred, no institution, including gigantic banks, is protected from instability within the marketplace. So what happens I think if we try to follow which was actually very good advice from our parents and grandparents. I really want to stress this that a lot of times when you get advice about careers from family members, it’s because they are trying to tell you what they believe is going to keep you happy and healthy and protect your family, but that is based on the assumption that there is long term stability in companies, that there is not an total short-term focus on quarterly profits which we know happens in companies. And then you used to be here in the Phoenix area, when we had the crash in 2007, 2008, my husband has a construction company, oh my God, we went from living large to having everything totally decimated. So as a small business owner, things can change in an instant. So my positive perspective on that is as long as we’re not expecting that things are going to be stable, then we can be agile, then we can look ahead and have many different ways that we’re prepared in case our plans change. Jay: One of the things that goes into that, and you walk people through this very effectively in your book is that you’re not just about one thing. Your skills and your career is actually a collection of other things that you know. It’s sort of a basket of abilities. And many people I think try and pigeon hole themselves as I’m an account, or I’m a homebuilder, or I’m an author, but you’re actually a bunch of other things. Can you talk about how you came upon that realization and what people can do with that knowledge? Pam: Well, I think the central premise of the book given the title is that the purpose of our life is to create a body of work that we’re very proud of, so that can be tangible things like books and software code and building organizations and thinks like that, but it can also be intangible things building love and trust, and an amazing experience in life within your family, and because we probably will be doing many different things throughout the course of our career, either by choice or not, even people who want to stay on one track may not be able to, but when we really focus on what it is that we really want to create, first of all, I think it becomes more fun and engaging because you realize you have a lot more control over the quality of your life, the kinds of projects that you engage in. Jay: One of the things that I see young professional in particular struggle with is that they don’t believe that an ingredient has enough legitimacy to be really be a template for what they do. You hear all of the time the notion of faking it until you make it as if that is somehow disingenuous, that because you had done something on the side-I see it in social media all the time. Of course my field where people say, well, I did social media for my church, or my sorority or for my whatever, but I didn’t get paid to do it, so therefore I really don’t know how to do it, so therefore I’m faking it until I make it. What do you think about that? If feels like people don’t give themselves credit for what you talked about in the book, their side hustle, or about something else that they have been involved in that means a lot to them. But it’s just not on their business card. Pam: Exactly. I mean I’m a living testament to that. For 10 years I was the volunteer executive director of a non-profit martial arts organization. Actually, when I was doing it, I never considered that to be real work, and I did it for ten years. I raised hundreds of thousands of dollars. I started a youth program that grew to 250 youths. I produced performances. It wasn’t until I started working for myself that I went, wait a minute, I actually do have some entrepreneurial skills, because of what I’ve done in my entrepreneurial experience. So what we want to look at is the process of development and mastery. I’ll throw down a martial arts metaphor for you right here, imagine that you’re walking into a martial arts school for the first time. You’re not going to walk in the door probably, if you’ve never done that art before, and think that immediately you’re going to get a black belt. You have to get your uniform. You have to go in. You’re going to die in sweat if you’re out of shape. You’re going to slowly work your way from belt to belt. There’s not a judgment of the fact that you’re a white belt; there’s a celebration that you’ve done what is required physically, emotional, and intellectually in order to learn what you need to do in order to move to the next step. So what you always want to be focused on is what are the skills that I am learning, whether or not you’re paid for it when you’re using a volunteer experience or a side hustle as an experience as a way to be a bridge towards that thing that you want to do. It’s an excellent thing to do and that just means that you need to define what are the requisite skills? If somebody has worked for a church and done their social media management, and you’ve totally engaged the church members, and you get more people coming in on Sundays, and your membership is growing, those are very specific tangible results, and that is a real skills. Jay: You talk about, and it’s not a huge section of the book, but I thought it was very appropriate, especially for today’s business and marketing climate about the 20X rule, about not making decisions based on one or two anecdotes. Every day in my business there are clients, even very smart enterprise corporate marketers that say, well, we tried that once and it didn’t work. Well, trying something once and saying it doesn’t work categorically is an anecdote. That’s not math, that’s not testing. Can you talk about the 20X rule and how to apply that to your life and to careers? Pam: Yeah. I found this a lot when working with people in starting up their businesses where a huge amount of effort is put into coming up with your first offer, and selling a class, or a product, and so many details relating to getting everything together. But then the assumption I think that many people have when they put it out to market is that a hundred people are going to come, and we’re hit every day on the Internet with examples how you too can make six figures in your consulting business in the first two weeks. And so if somebody puts out their amazing offer and gets one person who buys, and very often they can tell themselves the story that it wasn’t successful. The reality is there are so many variables when you’re first trying something that it’s really important to analyze what exactly you did in order to discover what are the areas you need to fix. Jay: Absolutely. The book also really has a terrific section about how to really define success personally, that there isn’t just one measure of success, and obviously, that concept has been talked about before, but I think you put it out there in a very compelling way, and making the point that people really have to understand what their own scoreboard is, right? And to not necessarily move those goal posts. So I ask you Pam Slim, how do you measure success? How do you personally know whether the things that you’re doing are working and that you’re on the right track. Pam: Yeah, the simplest form ever, but actually have some complexity behind it, and my basic definition of success is enjoying my life while I am living it. That’s a very important value to me. So what that means is that I am doing work that is in alignment with my values. And I’ll tell you, immediately, as soon as I’m working on a project that I don’t like, of if I have a partner where we’re not resonating in terms of values or if I never see my kids, and I’m constantly working and not at home, I’m not going to be feeling good at about what I’m doing. So it’s this constant barometer that I have of where I know what drives me is creating things what I’m really excited about, and feeling good about the kinds of people that I’m working with, a lot of the kinds of definitions that you do when you really begin to understand yourself and understand what drives you and what’s important. Jay: Fantastic, and I’ll make sure that my daughter calls you every Monday afternoon just to make sure you’ve got her on the right track. She doesn’t listen to me. She’s a teen girl. She doesn’t listen to me. I don’t know anything. She’ll listen to you, and she should, because you have written Body of Work, which I cannot recommend highly enough. It is spectacular. It’s going to be a modern classic. I promise you that. Pick it up. Pam: Thank you so much Jay. Have a great new year.